IndoorShoes Music is the Niagara Region’s premiere independent concert and events promotions company, having booked and hosted over 600 concert events since it’s founding in December 2010. IndoorShoes began primarily as a project to help local artists gain more exposure, but quickly grew into a business dedicated to booking and promoting local and touring artists in downtown St. Catharines. In 2011, founder Timur Inceoglu was joined by Erik Dickson and IndoorShoes soon developed into the city’s primary concert promotions company, hosting roughly 100 events per year at local venues. Following in the footsteps of the creators of SCENE Music Festival, Bedlam Society and Dine Alone Records, Inceoglu and Dickson worked to maintain the rich music history of Niagara by focusing on the development of local artists through concerts and an independent record label. IndoorShoes label releases include The Dirty Nil, Heavy Hearts, Spencer Burton, Limestone Chorus, Greys, Fiver and more. From 2010 to 2016, IndoorShoes produced a catalog of over 30 releases in a variety of formats. Following the departure of Inceoglu in 2015 to continue his music industry career in Toronto, Dickson continued to develop the company into larger venues with larger and more reputable touring artists. 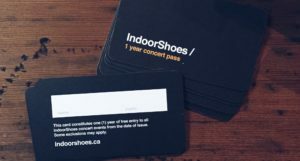 By early 2016, IndoorShoes had hosted over 500 events at a variety of venues across the region, including L3 Nightclub, FirstOntario Performing Arts Centre, Isaac’s Bar, The Mansion House, The Merchant Ale House, the Niagara Artists Centre and more. Dedicated to providing St. Catharines and the surrounding area with the best live music experiences, IndoorShoes has presented many of Canada’s most renowned artists, including The Sheepdogs, Dan Mangan, Tokyo Police Club, USS, Hollerado, Born Ruffians, The Glorious Sons, Said The Whale, Danko Jones, Protest The Hero, Alvvays, Classified, Terra Lightfoot, The Sadies, Silverstein, Fucked Up and many, many more. While it continues to host events at other venues, IndoorShoes is now the primary booking and promotions arm for Warehouse Concert Hall.